A tourist stands at the mouth of an ice cave in Iceland. There’s a reason Iceland is called ‘ice-land’. Glaciers of crystal blue ice blanket the country, slowly making their way over mountains and volcanoes as they finally crumble into a mirror-flat lagoon or the ocean. From afar, they are impressive bulks of indescribable dimensions. Up close, they define the meaning of ‘awe-inspiring’ as we humans try to grasp the sheer natural power of the ice. But the true beauty of glaciers can’t be appreciated without digging deeper. The natural ice caves carved out by these slow-moving giants are the crystalline hearts of the glaciers. 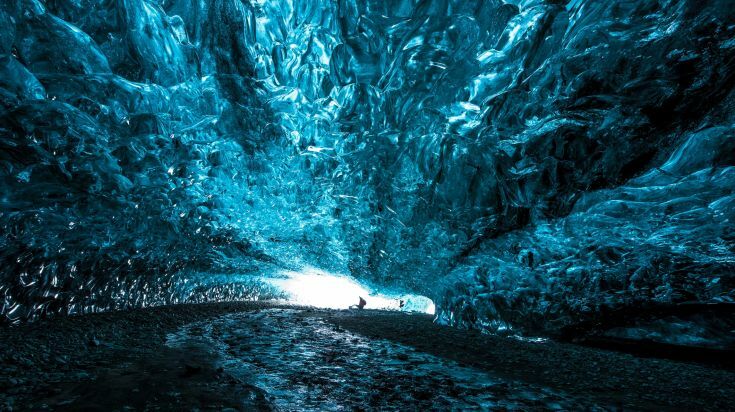 To really get to grips with the beauty and power of a glacier, you need to take an Iceland ice cave tour. Ice cave tours are only available during a short spell of the year, usually, from November to March. So, if you’re eager to explore the underbelly of a glacier in Iceland, make sure to book in advance, as many tours are fully booked before the start of the season. After March, the weather is warmer meaning caves are liable to collapse, as they move and reform each fall. Every winter, guides explore the glaciers for newly formed ice caves, meaning you can never step foot in the same ice cave twice! If you miss the window for ice cave tours, there are other similar options such as ice tunnels available during summer months. For safety reasons, it is imperative that you only head out onto a glacier and into an ice cave with a professional guide. Glaciers are constantly moving, closing and opening new crevasses which are easy to miss for the untrained eye. It is dangerous to traverse a glacier alone, so don’t take the risk. Equipment such as crampons will be provided, however be sure to wear warm clothing and suitable footwear even in the summer months. Iceland ice cave tours are a family friendly activity that will delight all ages. Vatnajokull glacier in the southeast of the country is possibly the most popular glacier for natural ice cave tours. It is the largest glacier in Europe, in a national park of the same name, and is accessible from Reykjavik. By car, travellers can take the Route 1 road along the south coast of the country. Be aware that driving times in winter are longer. Reaching Vatnajokull may take upwards of 5 hours from Reykjavik in winter months. Ice cave tours can easily be done in a day trip where you meet your guides on site. For example, for a tour at Vatnajokull, you may meet at the famous Jökulsárlón glacier lagoon or at Skaftafell. You’ll then head out to the glacier in a 4x4 and you’ll have a short walk on the ice before entering the cave. Normally, these tours take approximately 2.5 hours where you’ll learn about the glacier and the formation of the ice caves while taking in the breathtaking beauty of these crystal structures. If you’re not visiting Iceland in the winter months, but still want to explore deep into a glacier - don’t despair! Ice cave tours are still available year round. The difference is, these caves or tunnels are generally man-made. While the twists and turns of these caves haven’t been carved out by the glacier itself, they are still large impressive structures that let you experience the inner workings of a glacier. One of the most popular new man-made ice tunnels is located on Langjokull glacier - Iceland’s second largest glacier after Vatnajokull. Langjokull is so named for its oblong shape, and is located in the southeast of the country and is approximately 4 hours from Reykjavik. To reach the tunnel you will first ride on a huge 8 wheel truck that was once a NATO missile-launcher truck! This monster will take you on a 40 minute trip along the glacier to the mouth of the ice cave. Once just inside the entrance, you will be given crampons to aid your walking (though the floor of the cave is level) and any safety advice. The cave descends 30 meters down into the glacier and is approximately 500m long. You’ll learn a lot about the glacier and the formation of the ice. The walls of the cave allow you to chronologically track the story of the glacier, including when volcanic eruptions happened. Inside, you’ll get to explore the 5 beautifully crafted chambers that are lit up with colourful LED lights. For anyone feeling especially romantic, there’s even a wedding chapel where you can get married! 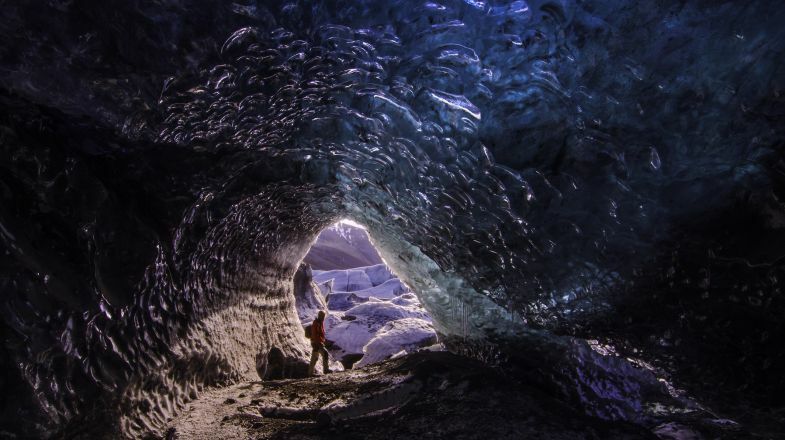 The Langjokull ice tunnel may not be a natural wonder, but it is still an exceptional way to explore the heart of an Icelandic glacier that’s available year-round. If you have limited time in Iceland and want to make the most of it, there are also combination tours that include ice caves. Ice cave and snowmobiling tours on Langjokull are available during November – April. A combination of the ice tunnel tour with a helicopter ride and a super jeep tour are also available during July – December. 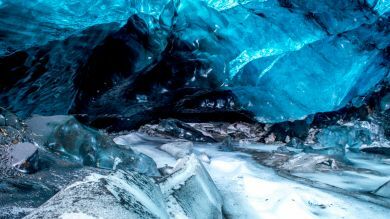 While there are many tours in Iceland that allow you to explore the ever-changing landscapes of glaciers, none are quite as up-close-and-personal as Iceland ice cave tours. Enter a frozen world of aquamarine ice that has been thousands of years in the making. 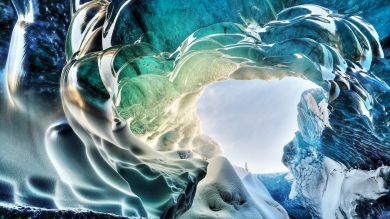 If ice caves tours interests you then you cannot miss some of the amazing glacier tours in Iceland.